A mum arrested in Dubai after calling her ex-husband's new lover a "horse" on Facebook will finally be allowed to come back to the UK. Laleh Shahravesh had collapsed in court after she was originally told her case would be adjourned for a week. But judge Mohamed Mustafa Ibrahim Khalil in United Arab Emirates (UAE) rushed through the ruling today. The mum, of Richmond, southwest London, was fined £600 for a "misdemeanour". Speaking immediately after the announcement Laleh said: "Just when I thought this nightmare was never going to end, after the court hearing this morning, now I know I am going home to my daughter! "I am overcome with happiness and relief. I can't thank Radha and Detained in Dubai enough and all the support I received from the public." It was previously feared she'd spend years in jail in UAE after she was arrested at Dubai Airport. She wept in court at a previous hearing and shouted "no, no". Her ex's second wife Samah Al Hammadi, 42, had complained to authorities Ms Shahravesh had called her a "horse" on Facebook three years ago. Speaking after the previous hearing, Ms Shahravesh said: "I just feel so sick and don't know how I am going to cope with more time here. "I really had hoped that the case would be dropped and I could go home to my daughter Paris. "I know she is going to be devastated like me when she finds out. I'm not sure how we will both cope being apart." Ms Shahravesh, who works in a homeless shelter, and her sister Laden Perry feared she'd lose her job if jailed. 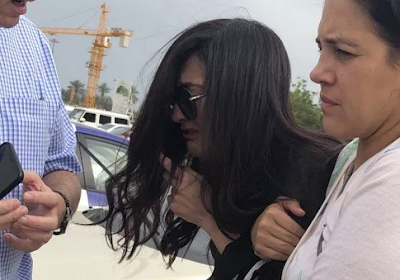 When Laleh told them she can’t afford to stay in even a cheap hotel while she waits and is in danger of becoming homeless in Dubai," she said. Dubai’s cybercrime laws state that an old social media post from before a person visits Dubai can see them heavily fined and jailed for years. Shey na today wife dey abuse new wife?